Hey Key Clubbers! 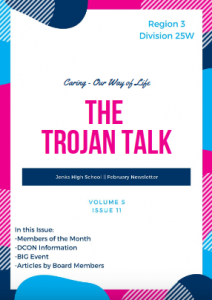 Check out the February Newsletter, here! It’s me, Lily Tennekoon, your Club Editor! Each month I am responsible for creating a newsletter that contains articles written by Board Members, pictures, project advertisement and members of the month. On a district level, we get points for our newsletters, the articles submitted, and pictures each month. These points add up and help determine the top 25 clubs in the Texas-Oklahoma District! I wanted to extend the opportunity to submit articles/pictures to general members as well. If you submit ACTIVE pictures (not staged or posing, but you or someone actively volunteering) please email those to editor@jenkskeyclub.org — Pictures must be of decent quality and if they have less than 5 people shown, I need names of the people in the picture. You can submit up to 5 pictures per month for 1 point. ***PLEASE take pictures while you are at your BIG Event projects! Hey all, here is the sign-up genius for the BIG Event on March 1st. This is a full day of service on the day we do not have school. REMINDER: please check your schedule before you sign up for an event! Check out the January Newsletter here! View the December Newsletter here!